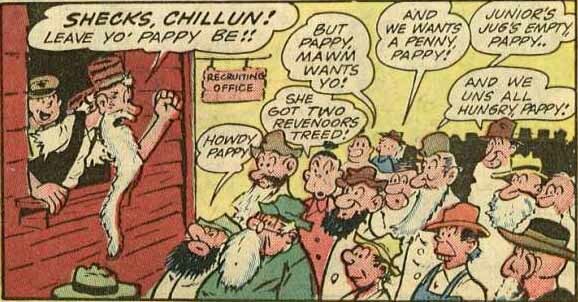 First Appearance: Police Comics #2 (Sep. 1941): "Lemme go, Maw"
Dewey Drip's maternal grandmother was referenced in the second "Dewey Drip" episode. While preparing to enlist in the U.S. Army, Dewey's grandmother gave him a bath, something the hillbilly was unaccustomed to. Dewey's father asked Dewey's mother what she was doing. 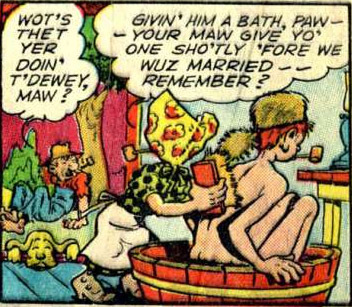 Dewey's mother explained: "Givin' him a bath, Paw -- your Maw give yo' one sho'tly 'fore we wuz married -- remember?"